In the darkest corners of the night in Caldwell, New York, a conflict like no other rages. The city is home to a band of brothers born to defend their race: the warrior vampiresof the Black Dagger Brotherhood. Payne, twin sister of the Vishous, is cut from the same dark, seductive cloth as her vampire brother. Imprisoned for eons by their mother, the Scribe Virgin, she finally frees herself - only to face a devastating injury. Manuel Manello, MD, is drafted by the Brotherhood to save her as only he can - but when the human surgeon and the vampire warrior meet, their two worlds collide in the face of their undeniable passion. With so much working against them, can love prove stronger than the birthrigh and the biology that separates them? 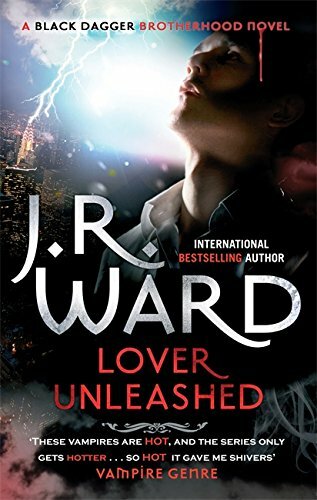 I used to be the biggest fan of the Black Dagger Brotherhood series, it was one of the first paranormal romance series I discovered and I read the first few books over and over again. Then we got to Phury's book and it all started to go downhill, yes, things did start to pick up again but I never quite regained my original love for the series. The little things had started to bug me much more than they ever used to, the silly names, the irritating slang, the evil beings that smell of baby powder (seriously baby powder? WTF was the Warden thinking?) and worst of all the way we seemed to get less and less of the main characters with every book. We were spending far too much time with other characters, even seeing things from Lesser's points of view which really doesn't work for me and the romance no longer felt like the focus. So I'd kind of put the series to one side and it took a long time for me to get the urge to pick it up again. In fact, it was almost 3 years to the day between me reading Lover Mine and deciding to pick up Lover Unleashed. I didn't exactly have high expectations going into this book, but you know what? That 3 year break did me the world of good and I absolutely loved being able to catch up with these characters again. I'd missed the brothers and I'm now starting to feel excited about the series again so I'm really pleased I gave it another chance. The things that used to really irritate me are all still there but they didn't annoy me as much this time around, possibly because they weren't as bad as normal or perhaps just because of my break but whatever the reason it worked for me because I found myself enjoying every minute of this book. It still isn't my favourite of the series but it's definitely my top out of the most recent ones I've read and I'm looking forward to continuing and FINALLY catching up to where the series is at now. I really liked both Payne and Manny, I think it would have been nice to have had a bit more page time between the two of them but I enjoyed what we got and liked the development of their relationship. I also liked the fact the way they handled Manny being human while Payne so obviously isn't. While we didn't get as much heat from these two as I would have liked there was plenty going round thanks to the other couples and they did have some really sweet and heartfelt moments that just made me smile. I think my favourite parts of the book were with V and Jane though, they have some issues that they needed to work through so it isn't all sunshine and roses but I was so happy with the way things worked out. Butch stepped up and was such a brilliant friend for V when he desperately needed one and I'm glad that they were able to build an even closer bond without crossing any non-platonic lines. There are also some lovely moments with Payne and V, they've spent so long apart and V didn't even know his twin existed until recently so they're relationship is brand new but they've already bonded and care about each other a great deal. Add in the changes we've seen in Qhuinn aswell as Xcor and his band of bastards and I'm excited to see where the series will go from here. I think I've refound my love for the Black Dagger Brotherhood and I'm really happy about that.